Saferock provides solutions for many different types of projects, and we may also providean experienced project manager or project management team that will manage and guide both the client and our internal team to help ensure project success. Utlizing an established process, Saferock's project management team can manage these complex projects. Identify a project and its timeline by examining the goals of the project and agreeing on project requirements. Key deliverable is the Requirements Document. Build the Project Plan to guide the project. Document includes key information such as a project timeline, scheduled milestones and key team menbers. Key deliverable is the Project Plan. Build a style guide and create necessary look & feel for the project. Key deliverable is the project design. Establish benchmarks and train staff as required, making the most out of Saferock's technology and processes through best practices. Key deliverable is the alpha and beta versions of the product. 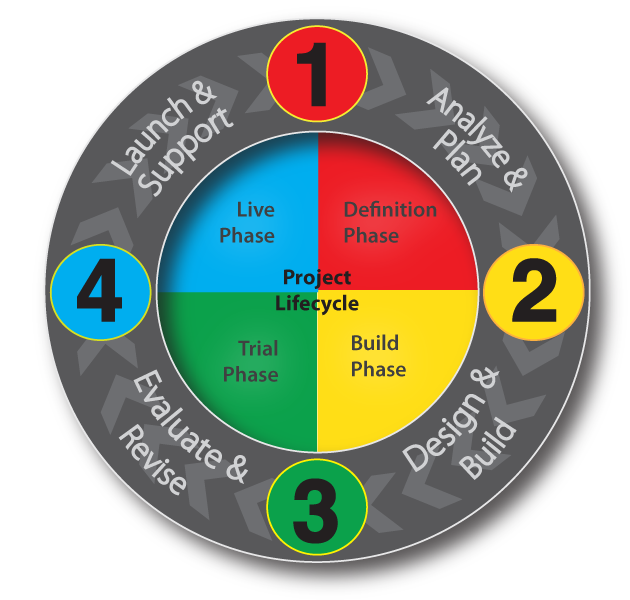 Evaluate Proactively manage the project, control errors, and offer ongoing feedback for process improvement. Revise Ongoing review and revisions as the product nears completion. Additonally any project changes are factored in to the project plan, and project requirements as required. Launch Deliver the completed project. A complete debriefing is conducted with both the Saferock team and your team to review performance against established benchmarks and identify process improvements for future work. Key deliverable is the final product. Support After launch, Saferock provides support as necessary for the project. This may include additional revisions and updates to the final product as required. Our team has completed hundreds of high quality projects for English, Math, Physical Science, Reading, Social Studies, state-specific versions, Teacher's Editions, and TWEs.